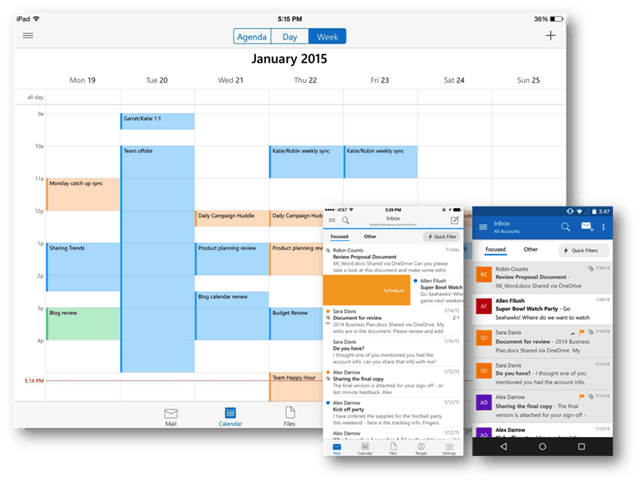 Microsoft launched new Outlook apps for iPhone, iPad, and Android devices. The new version has been simplified interface and it can be downloaded now. Microsoft this week announced the launch of new Outlook apps for iPhone, iPad, and Android devices. The release comes just two months after its acquisition of the Mobile Email Dev shop Acompli and it’s pretty clear Outlook for iPhone and Android is a rebrand of Acompli’s previous, very popular product. Compared to Microsoft’s own Mobile email app OWA for iPhone, Outlook is a faster, simplified version with a cleaner interface which support both iOS and Android. You can download it now through Google Play or the Apple app store. It looks like this version will help you keep track of your most important email, and you can delete, archive or schedule messages with just a swipe — reminding me a bit of Google Inbox, released late 2014. The calendar is built-in and makes accessing your calendar from email a lot easier. According to the iOS description, it will work with Exchange, Office 365, Gmail, iCloud, Yahoo Mail, and of course Microsoft’s own Outlook.com accounts, which includes @live and @hotmail, too. The version for iPhone and iPad appears to be the polished version, but the Android version is still in development but available as a “preview” versions for both phones and tablets. The following video from Microsoft gives you a look at the new Outlook app in action for iOS devices. We’ve just downloaded this ourselves and will have a more in depth review of it for both platforms after using it for a week or so. For now, check out the video below, or download the app on your device from one of the following links. In case of ios… Only ios 8.0.0 and higher supported. I installed the new app and deleted my “Microsoft Exchange ActiveSync” account on my GNoteEdge. I immediately found that it does not seem to sync the contacts from my Office365 account to my phone and I don’t see anything in the settings to allow/disallow this option. Because of that, I backed everything out and reconnected my ActiveSync account on my phone. Until they get it so that I can get my O365 contacts to my phone, I’ll be passing on this new MS app. Anyone else see this problem of find a resolution to it?